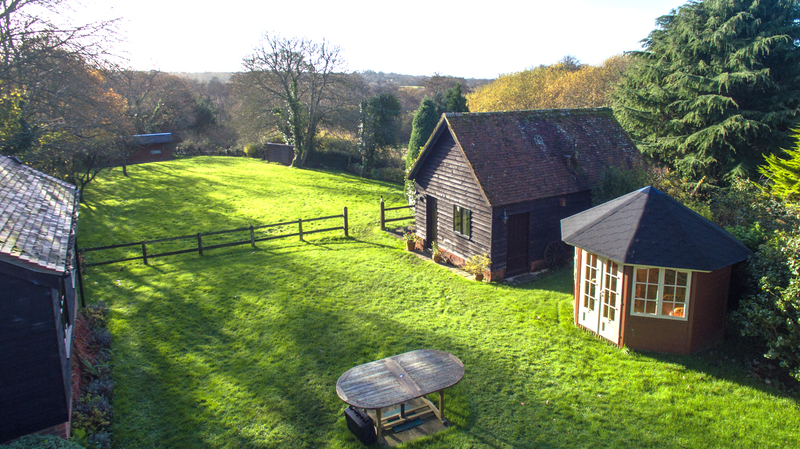 Walks in the New Forest Hampshire are a priority at the New Forest Dog Hotel. You can see from the photograph that we’re just out for one of our walks in the New Forest Hampshire. The New Forest National Park is on our doorstep. When your dog comes to stay with us they will get two thirty minute forest walks a day. We never walk more than two dogs together so you can be assured your dog will get the one to one attention they deserve. Our guests love our forest walks. It’s shocking that one in three pet owners say they never take their dogs for a walk, and only a little more than half walk them at least once a day, according to a survey of 4000 dog owners, many pet owners think it is enough to let their pet roam in the garden rather than go for a walk. It’s likely that playing in the garden isn’t enough to keep dogs healthy, as a survey of vets by the Association for Pet Obesity Prevention in 2012 found that over 50% of dogs were overweight or obese. As for their owners, 60% of us need to lose some weight too. A regular, dedicated walking time ensures you and your pet are getting the minimum amount of activity to prevent weight gain. Unless your pooch wears a pet pedometer, it’s otherwise hard to know if he is getting in enough activity during the day. You may not have the luxury of walks in the New Forest Hampshire, but a walk in the local park, or along the road can do wonders. If your dog is driving you crazy with digging, chewing, and scratching, they may be just bored. Give your dog something to look forward to doing each day. Besides the simple fun of taking a walk, make it a trip to a free-run dog park for ball-chasing or fetching a frisbee. If you spend much of your day away from home or are deep in your own projects throughout the day, your pet may feel ignored. Time spent walking together will build the trust and deep bond that is the hallmark of pet companionship. You may have avoided taking your dog for a walk because he seemed scared and skittish around other dogs and people. He isn’t going to build any confidence alone in the yard. Walking on a leash with you is reassuring and gives you the opportunity to train better behaviour around those you encounter. 30 minutes of exercise per day is a minimum for both humans and dogs to reduce the risks of heart disease, diabetes, and even some forms of cancer. It promotes digestive health (that’s why you carry doggy doo bags). 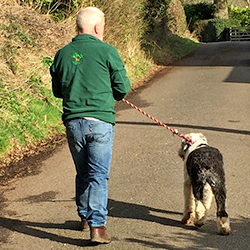 How much time should you spend walking with your dog each day? This is truly dependent on the breed, health, life stage, body condition of your dog, and weather conditions. Brachycephalic breeds (squishy-faced dogs – think pugs, bulldogs, even boxers) tend to overheat quickly as their respiratory tract is much shorter than other dogs, and panting is how dogs rid their bodies of excess heat. Double coated dogs like Newfoundlands and American Eskimos, as well as overweight or obese dogs, also have a tendency to overheat more quickly. So the recommendations that follow are basic and should always be discussed with your veterinarian. For a young dog in good shape, there is no reason why they can’t go for a vigorous hour walk/jog each day if the weather is not too frigid or too hot and humid. For puppies and senior dogs, it is important to pay attention to their cues and take shorter, but more frequent walks with the goal of totalling around half an hour a day. This rule should also apply to overweight and obese dogs as they begin a new workout regimen, working up to more and more time as your pup slims down and becomes more conditioned. For pups with arthritis, back problems, or other muscle, ligament or tendon issues, be sure to discuss a low-impact exercise program with your veterinarian and even look into other options besides walking as possible ways to get your pet the exercise he/she needs with minimal stress on the joints. What time of day should you take your dog for a walk? It’s generally better in the spring and summer to avoid mid-day walking, considering early morning and evening hours as the cooler times of the day. We tend to go on forest walks in the morning and early evenings. Just make sure your pets always have their flea and tick prevention up to date. In the winter hours, the exact opposite is true and aiming for a mid-day walk may be the warmest time of day and the least frosty for their little toes! What kind of lead or harness is best to use? I am not a fan of extender leads for numerous reasons, but suffice it to say that they are the least safe type of lead on the market especially if you are walking along roads where excited dogs can dart out quickly. A strong leather or canvas 4-foot to 6-foot lead will be the safest choice. A very well-trained dog will do fine with a regular collar and lead set up, but for most dogs of average training level or lower, I prefer a well-fitting harness as it provides a more even distribution of pressure across multiple areas rather than a collar that only pulls on the neck and trachea. Are there precautions when walking a puppy? Puppies need lower impact exercise than adult dogs due to the fact that the growth plates in their bones have not closed yet and can be prone to damage with higher impact activities. Slower, more leisurely, and shorter walks multiple times a day are a great way to get in the cardio without the damage to the little one’s joints! Are there precautions for walking an elderly dog? Elderly dogs in good body condition with no preexisting conditions can usually withstand close to that of their adult counterparts, but any arthritic, endocrine, cardiac or other condition needs to be taken into account. Work with your veterinarian to figure out what your particular pup can handle before starting any exercise program. Should you set a routine time to walk each day or vary it? This is totally up to you, but dogs like predictability. If you establish a routine, your pup will be sure to remind you. We go on forest walks twice a day. Once in the morning at around 7.30 am, and once in the early evening around 5.30pm.